21 things teachers can do to grow their PLN! Pinterest is quickly becoming a popular tool for teachers to share resources. 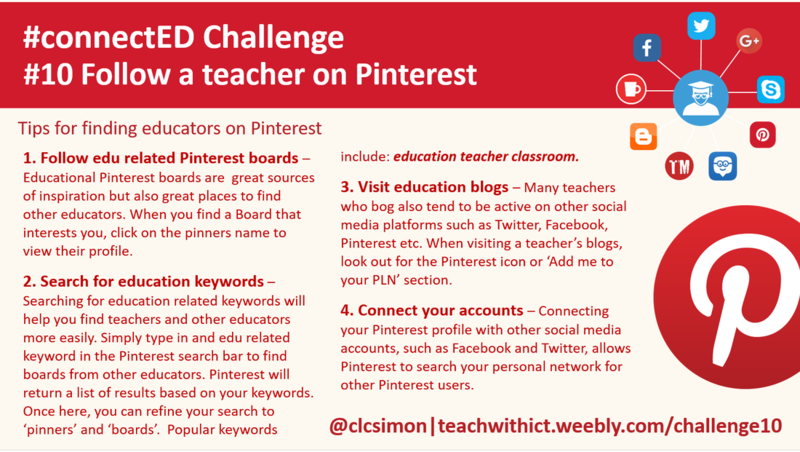 So, what is Pinterest and how can it be used to help you become a more connected educator? Pinterest is a visual bookmarking tool that enables you to ‘pin’ images from blogs/websites and collate them so as to make it easier to find later – great for finding and curating classroom resources. With Pinterest, you can upload, save, sort and manage your pins by categorising them (known as ‘boards’). For me, Pinterest has been a life saver - thanks to the plethora of free resources, it has saved me hours of planning time allowing me to concentrate on other aspects of my teaching! ​Not only that, as with or social media platforms such as Facebook and Twitter, the ability to follow the people whose pins interest you makes Pinterest a great tool for connecting with other educators. http://www.edudemic.com/guides/the-teachers-guide-to-pinterest/ - A teacher’s and student’s guide to Pinterest. http://edudemic.com/wp-content/uploads/2012/04/How-Educators-Use-Pinterest-800.png - Infographic show how to use Pinterest in education. Follow education related Pinterest boards – Educational Pinterest boards are great source of inspiration but also great places to find other educators. When you find a Board that interests you, you have the option of following that board directly or follow the Pinner. Clicking on the pinners name will take you to their profile and also show you what other boards interest them. To follow them, simply click on the follow button in the top right hand corner of their profile. Visit education blogs – Many teachers who bog also tend to be active on other social media platforms such as Twitter, Facebook, Pinterest etc. When visiting a teacher’s blogs, look out for the Pinterest icon or ‘Add me to your PLN’ section. Connect your accounts – Connecting your Pinterest profile with other social media accounts, such as Facebook and Twitter, allows Pinterest to search your personal network for other Pinterest users. Because Pinterest is an open network, you don't require special permission to follow other people or their boards. Also, as with Facebook and Twitter, once you’ve followed an educator you can view what boards or people they follow to help you build your PLN (Personal Learning Network). http://www.shakeuplearning.com/blog/50-educators-you-should-follow-pinterest/ - List of 50 educators you should follow on Pinterest courtesy of Kasey Bell. Covering your backside - 10 tips for staying safe when using Social Media.